Ten June: I Love Lamp! Love it! - Especially that it was your Nana's!!! You and I are totally on the same wavelength. I wrote a post with the same title last fall. LOL. Love Brick. 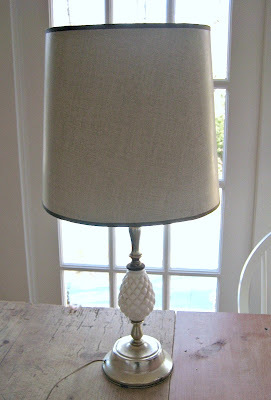 i do love the lamp- it's very pretty! and i can't wait to see the new furniture it will sit on! oh, and i think the tulips look lovely- i like when they flop over like that and spread out. Nice reference, ha! Glad your party was a blast and the lamp looks GREAT! Love your lamp! Too cute! Anchorman was the soundtrack to my life for the first year we were married - we were still students and didn't have cable and hubby watched Anchorman and Wedding Crashers over, and over, and over. I love the lamp! I have some old milkglass lamps kind of like that, too. Never thought about updating them like that, though! I actually think the tulips look pretty arching over like that. WOW- Go Nan! is it Milk Glass? LOL- I love lamp! you are too funny! I can't listen to that song "The window, to the wall" without thinking about your bathroom LOL. What a great lamp. I love it! Too funny about not taking pictures. I do that all the time...having way to much fun!!! I love the lamp. What a great find! Great redo, Michelle! It looks so clean and simple! That lamp is amazing! I love finding things from my grandparents to display around my home. Jen, great lamp....love the shade too! You always put it all together so well! 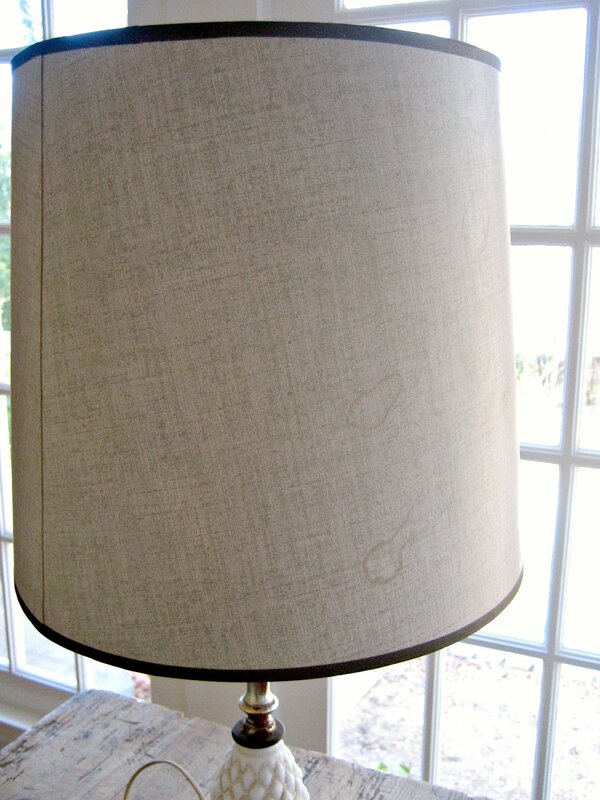 umm i love lamp too!!! and the fact that you just quoted anchorman TOTALLY made my night!!! a woman with my sense of humor?? love it!!! What a great find! So pretty! just came across your blog ;) you have such fabulous taste! what a great lamp! simply lovely! def would love to follow your blog! 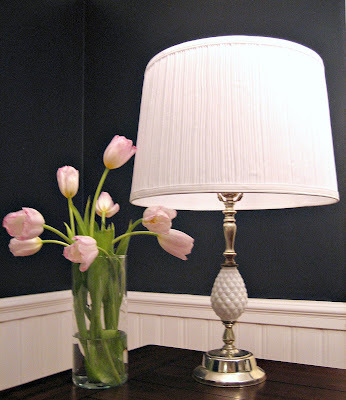 I love that lamp, and it looks fabulous now! You've got a new follower! I love it, Michelle! The detail on the post is so cute. Also, I love The Office, so this title rocks. LOVE IT!!! 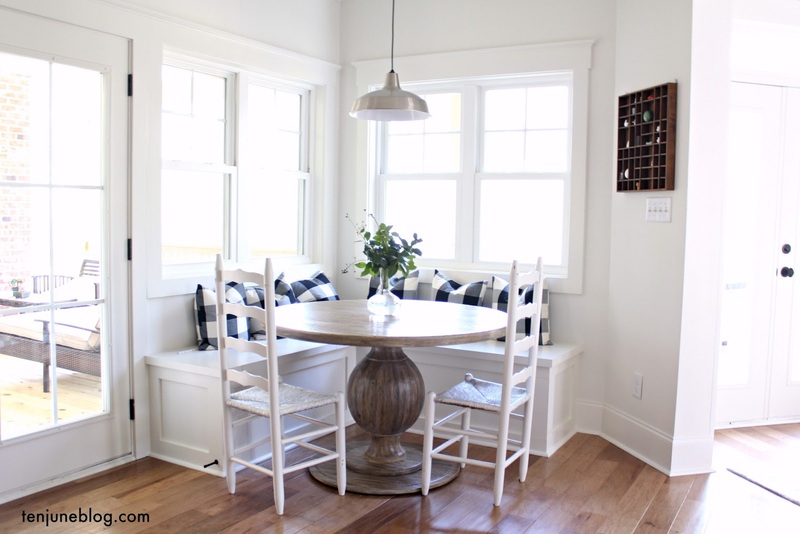 Love the interior of your home too! 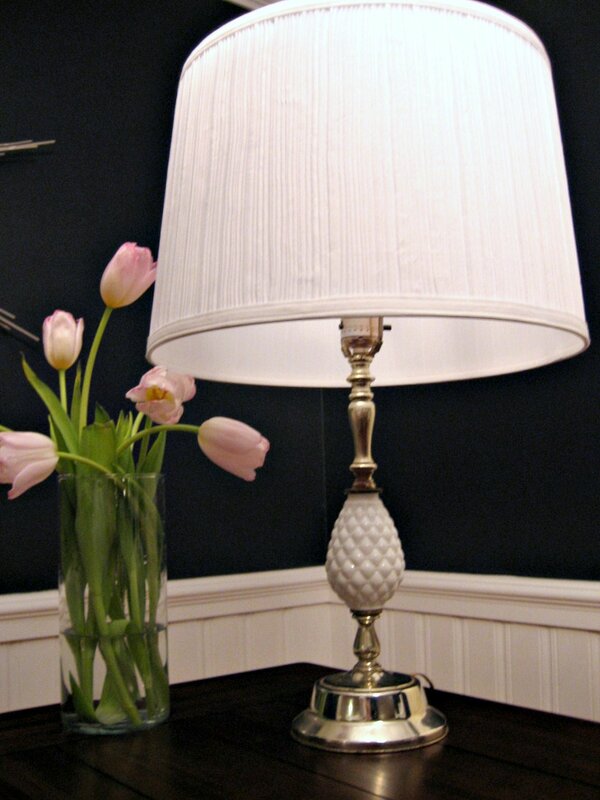 Your lamp looks very pretty and how special that it is your Nana's. Love the soft pink tulips! I always keep mine until the petals are falling off. They are such beautiful flowers. Glad your party was fun! Found you from MM! Super cute blog indeed! Can't wait to peruse through it. Do love the office photo in your sidebar and those risque bachlorette cookies! oh I love lamp too. lol Love the fact that it was free and your grandmoms! so sweet. Michele, do you mind if I show your DYI mirror on my blog?? thanks! found your blog on megan's this blog rocks post!! new follower! I love that lamp!! Is it old/Vintage? Oh and you tulips looks wonderful, I always keep my flowers until almost all the petals have fallen off. I just can't part with them lol. Very pretty - I bet you smile each time you walk by! 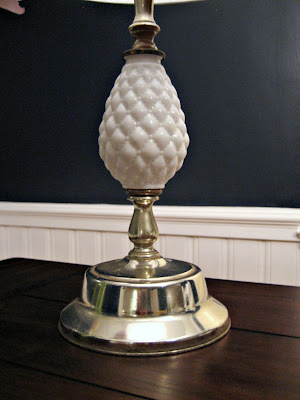 Visit my blog to see how I turned a brass lamp into a Pottery Barn inspired lamp! This is so beautiful ... lucky, lucky you!